Get Excited: Here’s How Mama Shelter is Bringing its Magic to L.A. 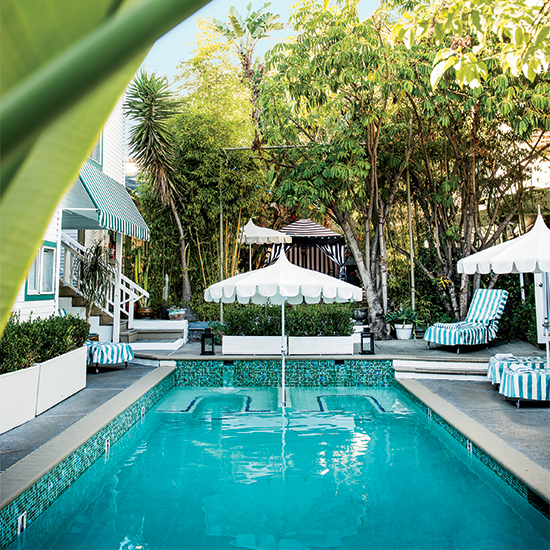 It was only a matter of time before the family that gave the world Mama Shelter hotels brought their egalitarian vision of cool stateside—and what better place than anyone-can-be-a-star Hollywood? The idiosyncratically hip hotel brand turned heads when it first rolled into starchy Paris in 2009, what with its playful Philippe Starck design, in-room iMacs, buzzing social spaces, and sub-$200 rates. The newest outpost, opening May 15, will be an interloper, too—$139 per night in chi-chi L.A.? The latter scenario may have happened at the Paris property, but it’s not a stretch to imagine a similar episode playing out in Tinseltown. For the brand’s first U.S. project, Trigano, who also owns the M+B Gallery in nearby Beverly Hills, tapped Thierry Gaugain, former head of design at Starck’s studio. Known for conceptualizing sleek yachts and a fashion retail spaces, it will be Gaugain’s first crack at a hotel. In a revived 1920s hotel (where Jimi Hendrix and Ava Gardner once stayed), the California influence is unmistakable. Among the quintessentially SoCal touches: a 1930s Spanish-style lobby and 70 pared-down rooms with whimsical touches like a Bert and Ernie headboard reading lights. Find also vintage surfer magazines, vending machines stocked with locally-made granolas, and chef Ben Bailly’s (Fraiche, Hotel Roosevelt) healthy spin on classic diner food. The rooftop gym and bar conjures Venice’s Muscle Beach. Mama’s interpretation of a screening room? A projector and strung-up sheet beneath the stars and a neon sign: Come To Mama Shelter. Trigano is mum about expansion plans within the country, but he sure seems to be enchanted by Detroit these days. Nate Storey is the editorial assistant at Travel + Leisure. Follow him on Instagram at @storeys.